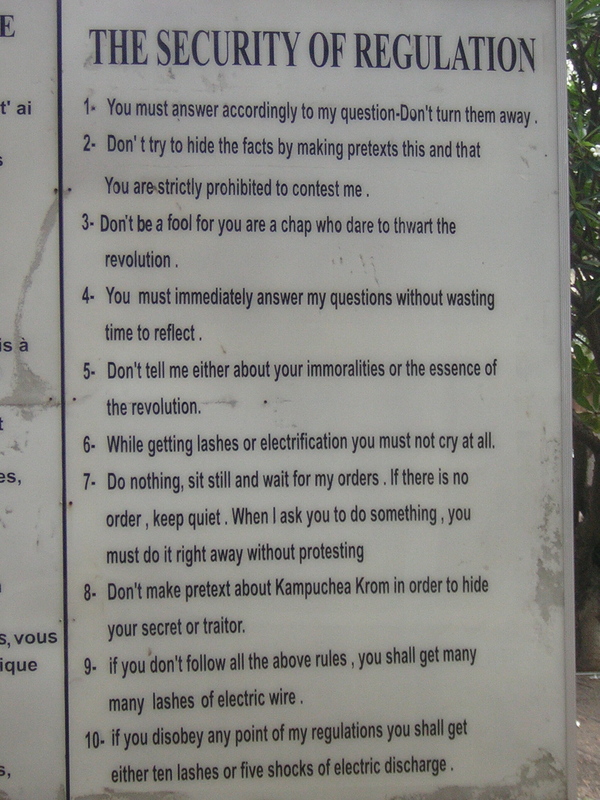 Yesterday, as a part of our cultural orientation, Allyn took Kim and me to Tuol Sleng. Tuol Sleng is a building here in Phnom Penh that was a high school before 1975. When the Khmer Rouge (KR) came into power in April, 1975, they expelled all of the residents of Phnom Penh to the countryside. 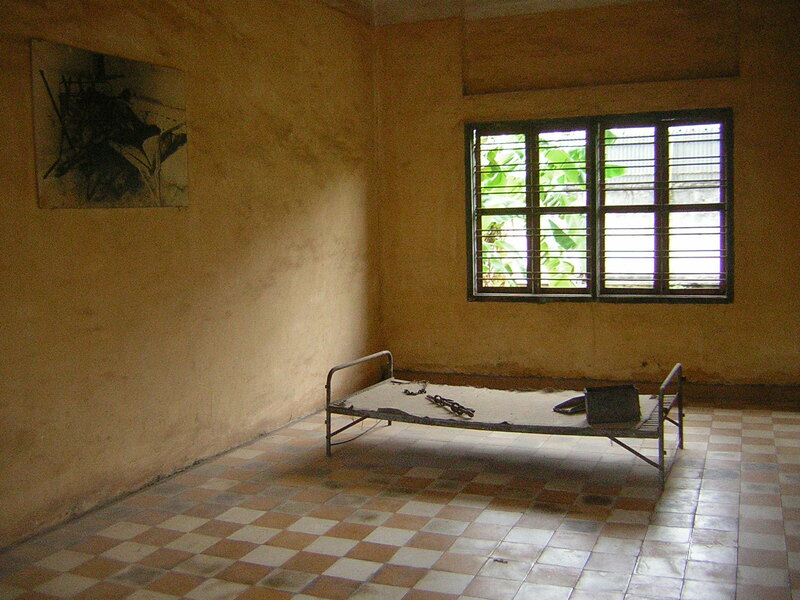 At that point, Tuol Sleng was transformed into a prison and interrogation center called S.21. Any perceived enemies of the KR could be taken there for interrogation, torture, and imprisonment pending a written confession. Most of the prisoners were targeted simply because they were educated and perceived as a threat. 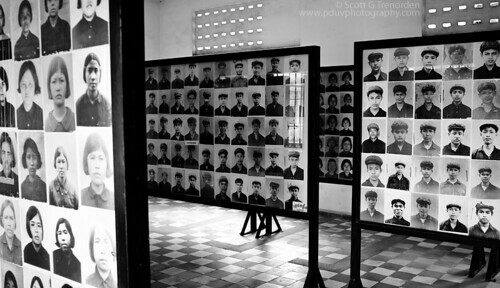 Since the Khmer Rouge documented their prisoners so well, there are photos of thousands of the victims displayed at Tuol Sleng today. Some photos display impish young children with smirks on their faces and terrified young women cradling their infants. Some men and women already show signs of torture in their photos, bloody lips and bruised faces. I felt sick as I wandered through room after room of torture chambers where they received beatings with electric whips, were hung upside down on gallows, had their fingernails ripped out, were bound in tanks of water, and were raped and mutilated by sadistic interrogators. Tuol Sleng was a place of terror and dispair. Only about a dozen of the thousands of prisoners that passed through that prison lived to tell their stories. 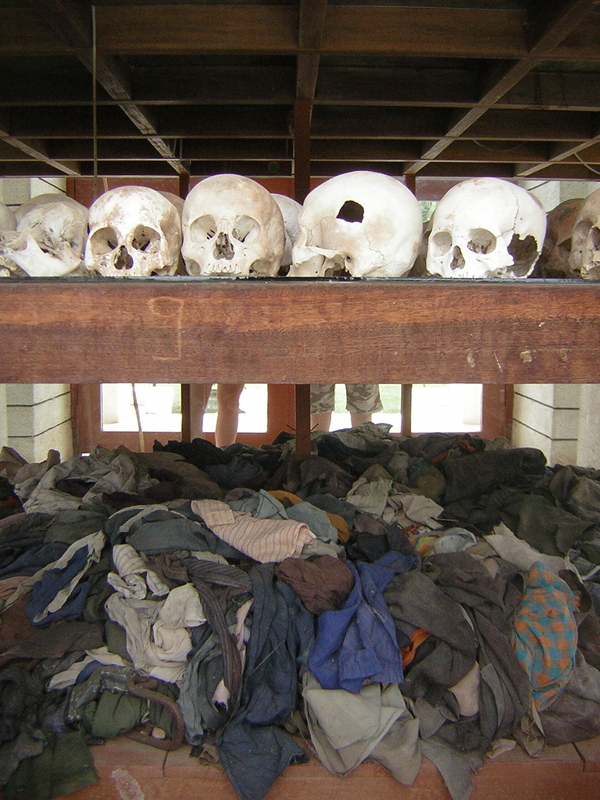 From there, we traveled 15 kilometers to the infamous killing fields. When the KR was through with their prisoners, they would take them here to dispose of them. We saw thousands of skulls encased in a glass case inside of a Buddhist charnel. We walked the grounds and saw the pits where the mass graves were unearthed. Victims clothes and bones were protruding through the dirt on the path. We saw the “magic tree” which, in the time of the KR genocide, held a loudspeaker that blasted music to cover the moans and cries of the victims. We saw trees upon which babies were beaten to save bullets, sharp palm fronds that were used to slit the necks of children, and pits where women were thrown after being beaten, raped, and killed. I was overcome by the heaviness of the evil and hatred in this country’s recent history. One thing that really grabbed me was a comment in the guest book at Tuol Sleng. A man had scribbled in bold letters, “Where was ‘GOD’ when this was going on? !” A gentle soul offered a response a few pages later, but the question was more striking than the simplistic answer. 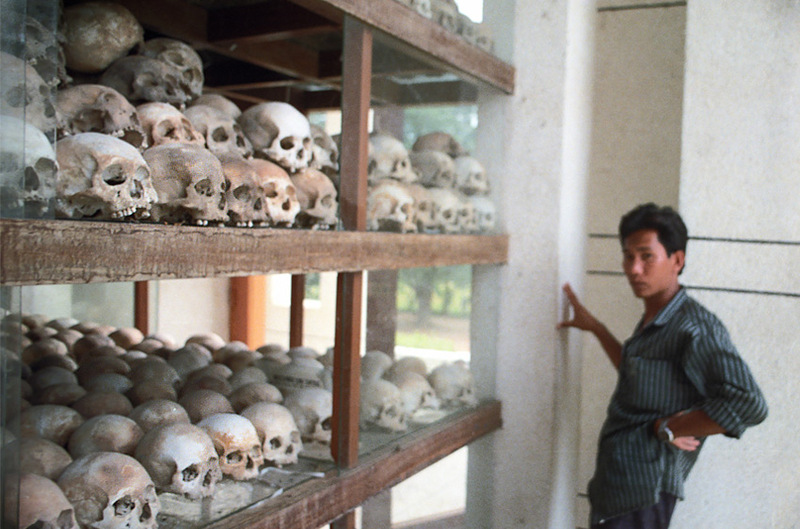 The Khmer Rouge declared to the people that God was dead. To many, they proved it. 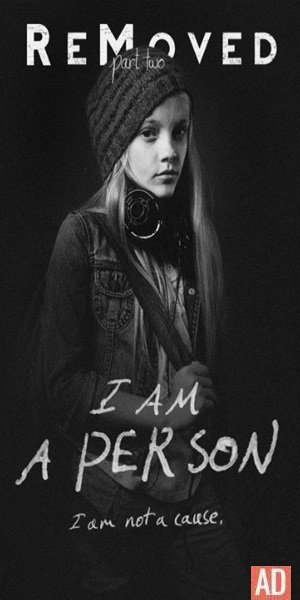 Posted by Jennie Joy on May 8, 2007 in Awakening, Photos.